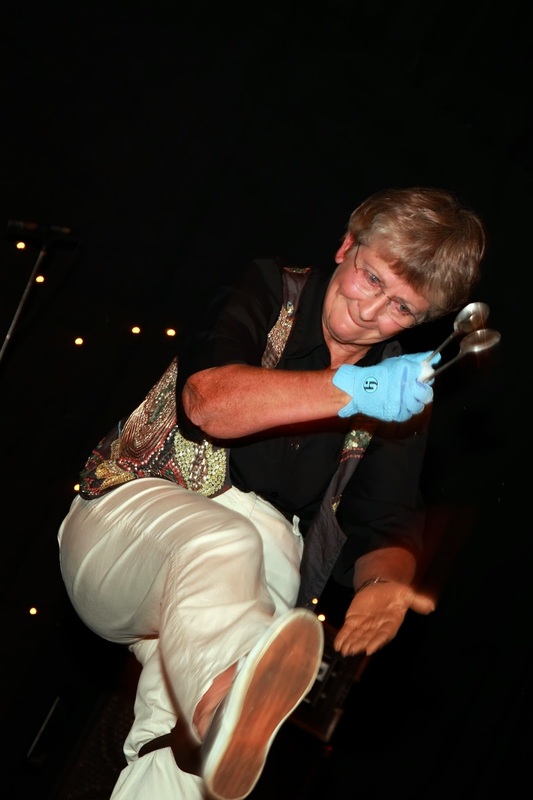 Deb "Spoons" Perry wields her silverware with staggering dexterity. There's nothing more exciting than someone who is deadset passionate about something. 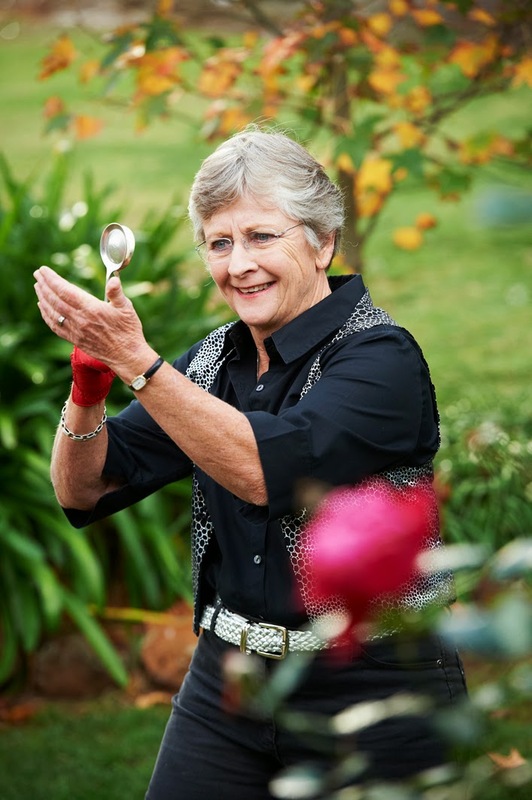 If you’ve been anywhere near the internet you’ve probably viewed the compelling work of percussionist Deb “Spoons” Perry, a West Australian grandmother, farmer and all-round likeable chick who happens to make magic with silverware. As if she weren’t fantastic enough, Deb or Spoonsy as she is sometimes known, is an animal lover and pet owner, and was happy to share her story with SAT. And if you aren't familiar with her work, you need to set aside a a few minutes to watch this (be prepared...its hard to resist the urge to tap along). Tell us a bit about yourself – who you are and what you do? I am aged 65 and have been married to Bill for 40 odd years. 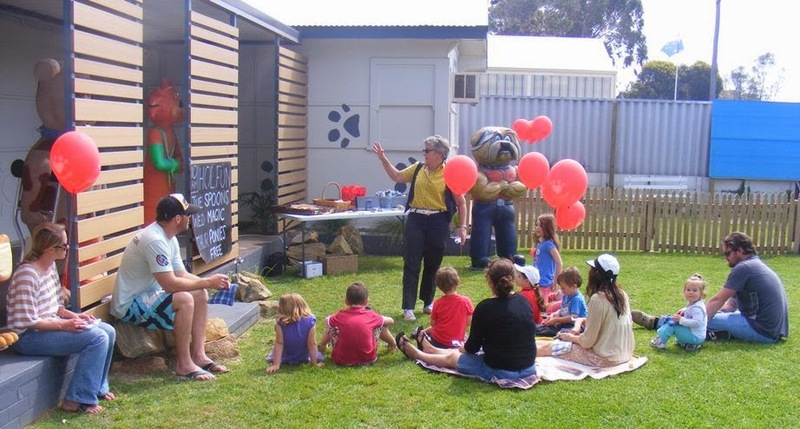 We have lived in various places in including W.A. New South Wales and Queensland. For the past 10 years Bill and I have owned and run a 300 acre sheep farm near Bridgetown in W.A’s South West. Bill still works full time and I work on the farm, do the odd days relief teaching and keep myself busy running my small spoon business. We have three children, a son who is a plumber, a winemaker daughter and another daughter who makes promos for Channel 7. There are 4 grandchildren with the eldest being 5. 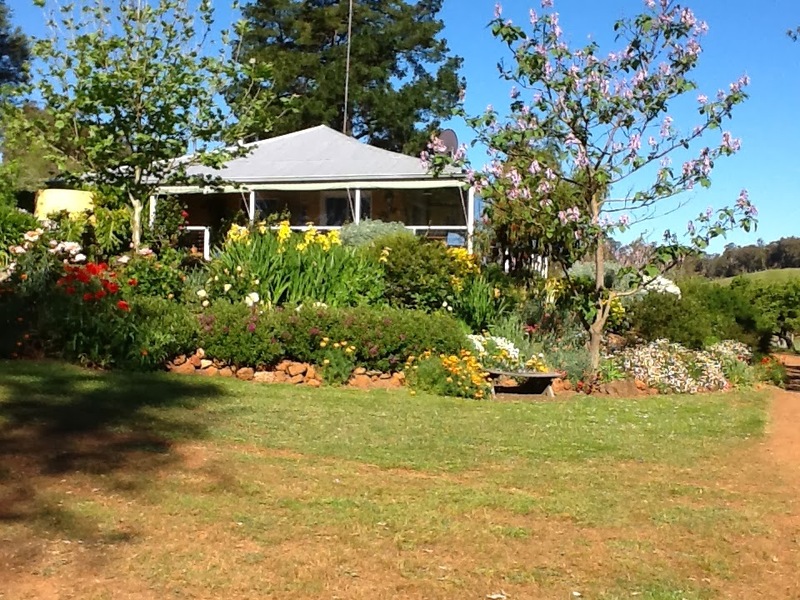 I live in an old farm house with an extensive garden in a beautiful gully with dams and revegetated creeks that flow all year. I love all outdoor activities, walking, swimming, kayaking, gardening, bird watching etc and I am very interested in the natural environment. I am a percussionist, learnt in my teens and still have and play my 1960’s drum kit and also play congas, bongos, spoons, rhythm bones and bohran. I play drums in the Manjimup Jazz Ensemble and with other local musicians. Deb's place. No wonder animals love the garden! When did you realise you had a knack with the spoons? Soon after an elderly man Danny (probably my age now??) taught me to play them in a wine bar in North Fremantle in about 1972. They initially were played in the kitchen when a good tune came on the radio…..I still do that!! In your videos it is clear you love animals. What animals did you grow up with? As a child we had a family cat “Puska.” In my teens I encouraged a stray dog to my window each night with food until Mum and Dad said I could have him. “Stigs” was over sexed and got into lots of trouble!!! My Dad loved telling stories of his exploits. He had to be put down as he bit the dog catcher. What pets do you have now? 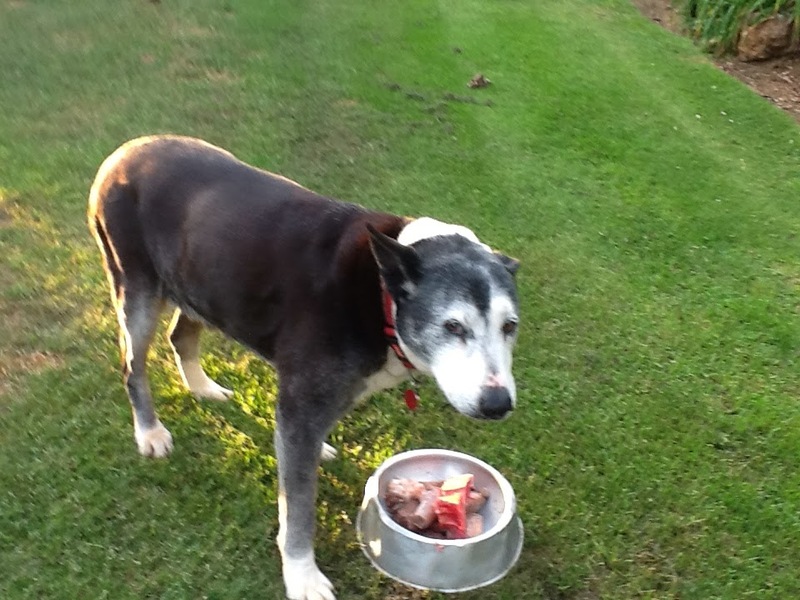 I have Jess the 13 year old Staffy and Indah my daughter’s Border Collie/ Bull Terrier cross who is 16. Indah enjoys the fruits of a neighbour's deep-freeze clean out. I also enjoy my chooks, give them names, and I have a resident King Skink, Russell, who lives in our roof and enjoys the odd egg. Jess, pictured at the same sitting. There are 500 odd sheep that I help look after and enjoy handling and keeping healthy. I pat the lambs when ever I can and often give the sheep in the race a pat on the head and talk to them as I move them along. Deb really enjoying a song. As someone who clearly has plenty of pets, have you had any memorable interactions with vets? Bill and I lived on a station in the Pilbara region of W.A when we were first married and my wonderful Red Cloud Kelpie “Quei” had eaten a bait that was put out for the dingos. We rang the Roebourne vet 200 km away in desperation to get advice. I spoke to Ric and related his instructions to Bill who tried in vain to save her. It was horrible. 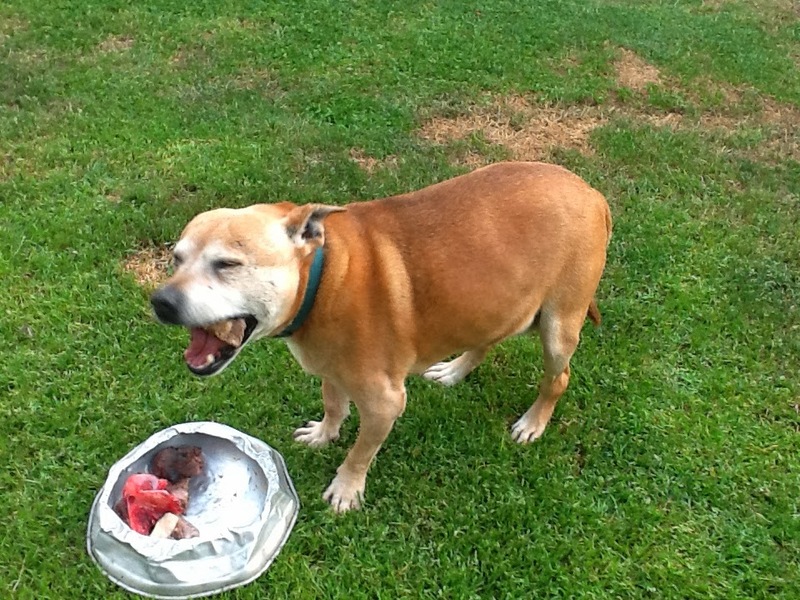 That same vet had a Red Cloud Kelpie who spent her days under his desk peacefully sleeping as he saw clients however after work she would not let another dog go near him and was very possessive. He did an excellent job as he had a huge area to cover. Ric was Red Dog’s vet. 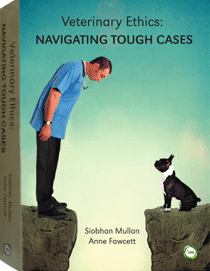 I have always found vets to be wonderful caring understanding people with a lot of patience. Can you give us an insight into your daily routine. How much looking after do they need? My day starts with a long pat for the dogs by my bed after Bill has let them out of the laundry where they sleep. I always give them cuddles and pats through out the day and talk to them and check them out. They sleep most of the day now. When I have breakfast outside Jess now waddles after her Zoomer and Indah goes “Wooo” and sometimes throws her bone in the air. She still thinks she is a pup at times. I let my chooks out, feed them and collect any eggs. At night they must be locked up or a fox will take them. My two Guinea Fowl are not nice to my rooster so I get cranky with them sometimes. In the evening I take the dogs for a short walk after much encouragement to get them going. Jess has joint problems and Indah has hip and leg issues due to two accidents. They both can’t hear very well, don’t move out of your way and Indah woofs in the evening at nothing and drives us nuts until we bring them both in and shut the door. You've been a bird watcher for some years. Where have you travelled to watch birds? It has been mainly where ever we have lived and when ever we have been holidaying be it camping, sailing, walking etc. I kept records and contributed to various Birds Australia projects through out the years. It has been very rewarding. My first kelpie Quei used to sit patiently beside me when I was bird watching not making a sound, however she knew there was a game and some fun on the walk home. I still gain huge pleasure in observing all the farm birds, their familiar habits, antics and personalities. How would you describe the bond you have with your animals? Jess and Indah are so special and I dread the thought that they may no longer be around. They both have had wonderfully long and interesting lives and I treasure every day. How have animals you have lived with changed you as a person? 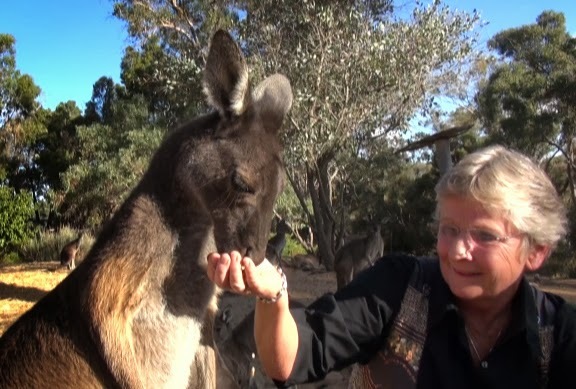 I am sure our family kelpie “Kebble” helped me be a better Mum in numerous ways. I have been softened and become more caring from their unconditional love and attention. I find I am happier with them around to chat to, help and enjoy. 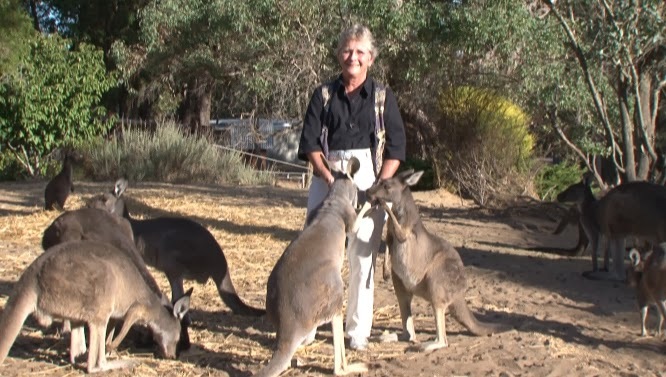 By just knowing they are with you gives you extra confidence when living in a fairly remote location and often being on my own and I never feel lonely. Your spoon-handling abilities are impressive. Veterinarians must learn to handle surgical instruments. Do you have any tips for persons entering careers such as surgery where dexterity with surgical instruments is required? (in other words, how much practice do you do???). It is like anything that you want to become good at it is practice, practice and practice. My dexterity with the spoons comes from being a percussionist. I constantly challenge my self when playing my spoons. I never listen to music without tapping and or strumming my fingers on something and I often get into trouble for doing it. Perhaps taking up a hobby that works your wrists and fingers would be a good idea…..it is all to do with being supple and I should add working both hands not just one. SAT sincerely thanks Deb "Spoons" Perry for being so generous with her time.